This painting was inspired by my shameless binge watching of CHARMED. There was an episode where Piper first learned to freeze time, and she was cooking at the time. As I was watching it, this image popped into my head. I also created a little story which conveys my feelings about cooking. I love food. I love the idea of cooking. I even love cookware and utensils. My problem is with the act of cooking. I hope you will get the picture after reading this mini-story. The ingredients rested on the counter in pristine condition – homemade pasta, ripe tomatoes, crisp carrots, onions, and basil leaves – all ready to chop, boil, and release heavenly aromas. 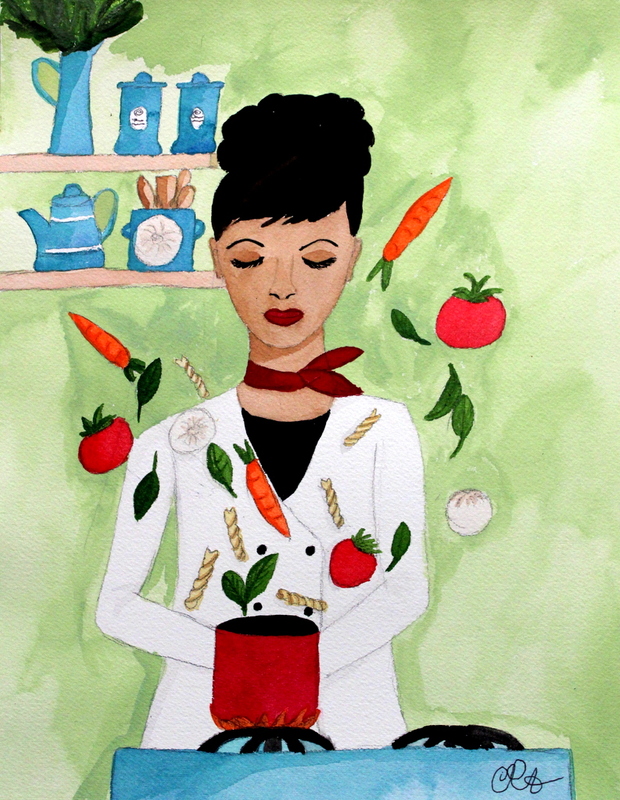 The chef, Penelope, seemingly ready in her white coat and red scarf, sharpened knives, shiny pots, leans on the counter with her head propped in her hands loathing the process required to make these ingredients edible. She daydreams about how the meal will taste, how her friends and family will applaud and rave about her meal. Then she sighs, and once again she puts the ingredients in the refrigerator, the cooking implements in the cabinets and drawers; then she picks up the phone to dial Luigi’s Italian Kitchen.